The biggest dream of any athlete is to represent their country at the highest level. All athletes, irrespective of their physical attributes, deserve equal opportunities to train and compete. 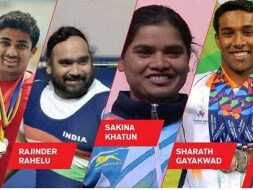 By raising funds for the GoSports Foundation para champions, I am endeavouring to support them and ensure that they receive specialised training, so that they can represent India at next year's Paralympic Games in Rio de Janeiro. Their individual expenses are broken down as below. 21 year old Niranjan is a fighter. Born with a medical condition called spina bifida, he has undergone as many as sixteen surgeries already. These obstacles have never deterred the young swimmer from going out all guns blazing in the pool. He was recently named World Junior Champion at the IWAS Games in the Netherlands, winning 10 medals in all 10 events that he entered! Sakina is one of India’s premier women powerlifters. She has achieved success at the international stage despite being from a family of modest means. Initially a swimmer, her talent was spotted by her coaches when she lifted weights as well as her able-bodied counterparts did. Rajinder is an Arjuna awardee and an Indian powerlifter of international acclaim. He suffers from a condition of infantile paralysis, having contracted it when he was just 8 months old. Rajinder let none of it get in his way; turning to powerlifting soon after school. He is a bronze medallist at the Athens Paralympics. How are the athletes identified for support? - A rigorous application process at the foundation comprises application forms being circulated to federations across India as well as in-depth research to identify high-performing athletes deserving of support. Each application received is evaluated thoroughly by a sport-specific expert, following which the shortlisted athletes are interviewed individually. This interview is to determine which athletes would benefit the most from the interventions the foundation can provide. At what level are the athletes competing? - These athletes are already competing at the international level, and will be competing at various qualifying events for Rio 2016 Paralympic Games. Why should I support these athletes? - By supporting GoSports Foundation para-athletes, you are helping differently-abled athletes perform to their potential on a global stage. Their achievements would lead to a ripple effect, which would lead them to becoming role models and inspiring others to take up sport and strive for excellence.